In this article 'interviewing tips for candidates', you'll get more information and details help with your career knowledge, feel free to copy or share. 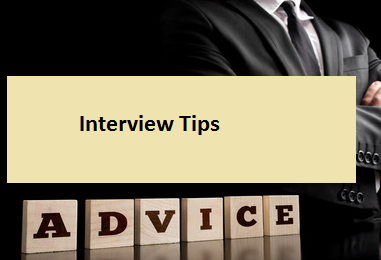 Know the time and place of the interview and the interviewer's full name and title. Ensure that you fully understand the job description of the position for which you are interviewing. Plan to be 15 minutes early in anticipation of traffic problems or other unanticipated delays. Also, know where you're going. If possible acquaint yourself with the route. Late arrival for a job interview is never excusable. Dress professionally (i.e. proper business attire). If presented with an application, fill it out neatly and completely. Ensure to shake the interviewer's hand firmly. Speak slowly and clearly. Don't rush your answers. Ensure to answer every question fully and honestly. Don't jump ahead or give more information than is required. Pay attention to "cutoff" cues. Ensure you are consistent in your answers throughout all interviews. Don't answer with a simple "yes" or "no". Explain answers where possible. Avoid saying anything negative about present or previous employers or co-workers. Ask questions to show interest in the Company and the position. Ensure they know you are interested in the position; never close the door on an opportunity. Look alert and interested at all times and look the interviewer in the eye. Relax, smile and have a positive attitude. Give the appearance of energy as you walk. The chronology should flow logically and bring you to the present day. You should then write down where you want to be in the short and long term and why it makes sense based on where you've been according to your chronology. Also, write down the reasons why you would be appropriate for the job you are interviewing for and why you are interested in the position. others as strength, i.e. you received a bonus in recognition, there were some savings achieved, you completed the implementation of a system, you met objectives, it was noted on your performance evaluation. B.) describe a characteristic that could be perceived as either a strength or a weakness. It is important to ask a lot of questions both throughout the interview and at the end of the interview when interviewers generally ask if you have any questions. Therefore, you should prepare a list of 5-10 technical and 5-10 non-technical questions and memorize them before the interview. Do not inquire about salary, vacation, bonuses, or other benefits. This information should be discussed with your recruiter. Could you tell me about the growth plans and goals for the company/ department/division? What needs to be accomplished in this position in the next 6-12 months? What types of systems do you use throughout the company/department/division? To where have successful people in this position advanced? What criteria will my supervisor use for my performance evaluation and how frequently, and in what manner, will my supervisor and I meet? How do you (the supervisor) like to operate in terms of assignments, delegation of responsibility and authority, general operating style, etc.? What long and short term problems and opportunities do you think my prospective area faces? What particular things about my background, experience and style interest you? What experience, training, attributes, operating style, accomplishments and personality factors should the "ideal" candidate for the job have? What else can I do to get a job offer from your company? What is the time frame for making a decision on this position? What do like most and least about your current position (or supervisor)? What are the best and worst things your boss would say about you? Name 5 adjectives that would best describe you. What are your concerns in your current situation and what would you improve? How have you changed or improved the nature of your job? What contributions to profits have you made in your present or former positions to justify your salary level there? Behavioral questions: i.e. Tell me about the time that you were most successful in dealing with a difficult client? or Give me an example of a time when you had to get something accomplished with someone whom is a bit more difficult to get along with. Only indicate what you are presently earning and that salary is one of several factors you are considering. Emphasize that the opportunity is the most important consideration. Emphasis on your recent experience is most important; however, brief coverage of previous experiences and education can also be useful. What are some situations in which your work was criticized? Give only one or two examples and emphasize how you addressed the criticism and how it is now not a problem. Ensure that you show you are open to constructive criticism. Create a positive image, even if this is not the case. How long would it take you to make a meaningful contribution to our company? Realistically speaking, experience and requirements of the job will influence your making a meaningful contribution. Why haven't you found a new position before now? Explain that finding the right job is more important than just finding a job. This can be a difficult task as the current economy may be a factor. Be as positive as possible. Do not discuss interpersonal conflicts, regardless of how sympathetic the interviewer may seem. Discuss economic conditions. Do not go into much detail unless asked. Why should we hire you? or Are you interested in this job? Explain why this is a logical position for you, sum up your work history and re-emphasize your strongest qualities and achievements. Above all, let the interviewer know that you will be an asset to the company. You should find out as much information on the Company and the interviewers as you can. The best sources are the public library, the Internet (you should check if the company has a home page) and your recruiter. If you get to your interview early, you should read any brochures they may have in the reception area. Another thing you may do is review any articles or books on interviewing. 2. Lack of a firm handshake. 3. Being unprepared for the interview, i.e. little or no knowledge of the company. 4. Poor expression of thoughts, including incorrect grammar. 5. Not asking questions about the job. 6. "Superiority complexes" and "know it all" attitudes. 7. Indifference or lack of enthusiasm. 8. Being evasive, nervous and lacking in confidence. 9. Lack of career direction - undefined goals or purposes. 10. Candidate is too interested in compensation factors. 11. Overaggressive, overbearing or conceited behavior. 12. Speaking unfavorably of previous employers. 13. Lack of courtesy and maturity. 14. No appreciation for the value of experience. 15. Not looking the interviewer in the eye. If you are interested in the position, ask for it or ask for the next interview if the situation demands. You might say something like: "Mr./Ms. Employer, I am very impressed with what I've seen and heard here today and am confident that I could do an excellent job in the position you've described to me. When might you be in a position to make an offer?" Your enthusiasm should make a favorable impression. If you are made an offer, accept it only if you are ready. You don't have to accept the offer on the spot. Don't be discouraged if no definite offer is made or specific salary discussed. The interviewer will probably want to communicate with your recruiter first or interview more applicants before making a decision. Thank the interviewer for his or her time and consideration of you. If you have answered the two major questions in his mind: a) Why are you interested in the company? ; and b) What can you offer?, you have done all you can. The first thing you should do after the interview is call your recruiter to let them know how the interview went and whether you are still interested in the position. At the same time, your recruiter will be determining the client feedback. The next thing you should do is send a thank you letter to your interviewers.